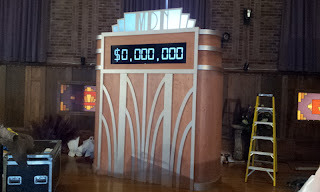 We were quite busy last week getting a set piece finished for the show "Million Dollar Neighborhood"
The 2nd season was shooting about 40 min. from the shop. 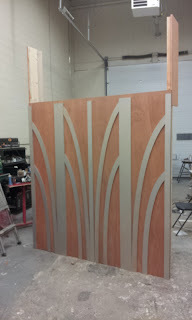 We had gotten a call for an art deco inspired piece that would disguise a rather large television set. The tv would be running a clock style counter for the final episode, counting up the total dollar value of the families involved, through various tasks and challenges. 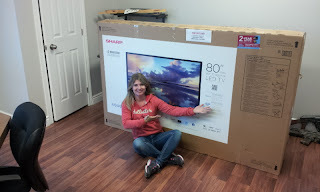 The production company delivered the tv to us on Thursday, so we could measure it up for it's new surround. 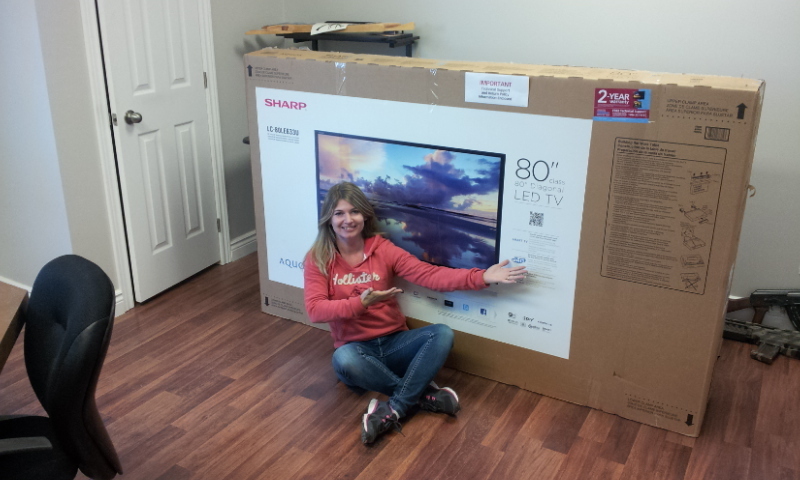 The tv was a little smaller than the box, but not by much. In fact, it's hard to believe they can get an 80" television down to 3.5" thick. It's total weight was around 140lbs. I had been busy last week sending drawings and renders back and forth with the set dec Kelly. We finally got a design locked down, and then came the task of breaking out the parts for importing into Aspire. 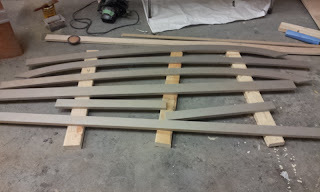 The piece will be around 11 feet tall. The numbers only sit on the screen in one location, and the optimal viewing distance from the ground would be 7 feet 9 inches. We're masking off most of the screen behind the surround, with only the counter numbers visible. The sides of the display will have stepped half round columns topped in "metal" trim. 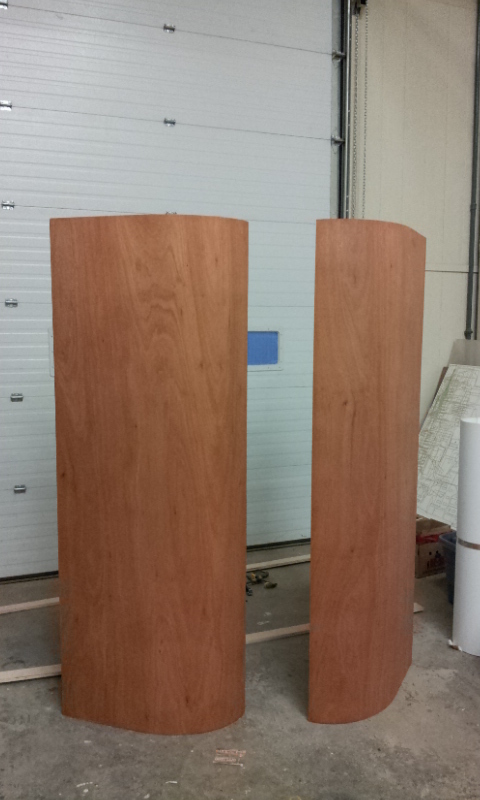 We started with the 2 half round column pieces first, as I thought they might be the most fidgety to deal with. 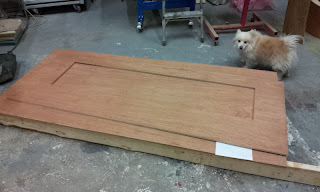 We used an 1/8" thick piece of mahogany plywood to skin the frame. Even for 1/8", it took a little muscle to wrap it around the 11" radius framework. 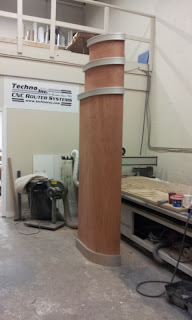 I decided I needed to kerf the 1/8"ply on the 2 stepped pieces at the top of the column. This probably took the same amount of time as not kerfing, and wrestling with the wood, but in the end, it was a lot easier. While I worked on the next set of Aspire files for our Techno, Jody got the 2 columns stained up with a slightly red-y orange stain. They didn't want the final piece to be a dark hole in the set, so we went fairly light with the colour. The whole piece breaks into smaller separate sections as the entry door to the location is 1 single large door, so we couldn't go very big on the parts. 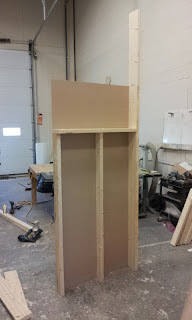 And as the tv comes in at 140lbs we had to go with 2X4 and 2X6 construction for the structure. 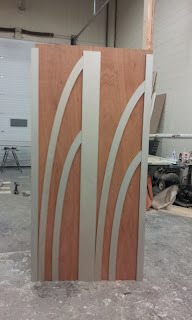 The face was skinned in 3/8" mdf, then we clad that in the 1/8" mahogany to match the end towers. 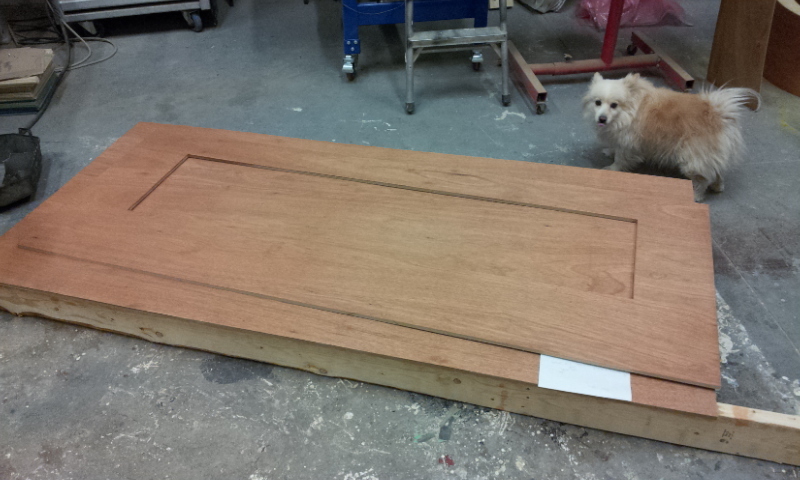 Little Finley wasn't overly interested in helping with the staining, so Jody was forced to pick up the slack. For the front of the unit, I designed some long sweeping curved pieces that we cut from 5/8" mdf. Having a Techno cnc makes fabricating components like this computer perfect, and VERY quick, compared with the early days of using bandsaws and jigsaws. 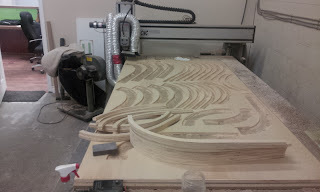 The best part of cnc is that it doesn't limit our designs at all. 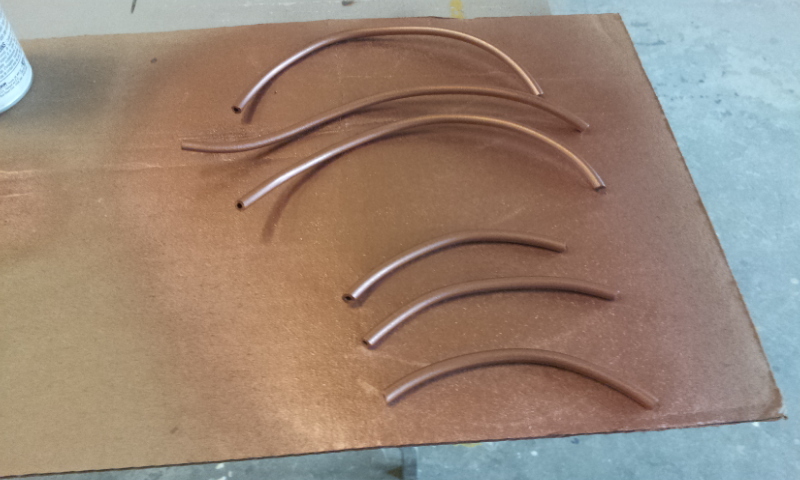 If we didn't have our Techno, I wouldn't be so quick to add long, sweeping curves to a design. All the trim strips on this piece were sprayed out with a Rustoleum bright silver, then we used a gold glaze, blotted on, kind of like sponge painting. This gave a beautiful mix of tone and subtle visual texture, all the while keeping the surface sheen a very consistent satin finish. Comparable to a satin nickel look. A little hard to read in the images, but it looks very good in person. 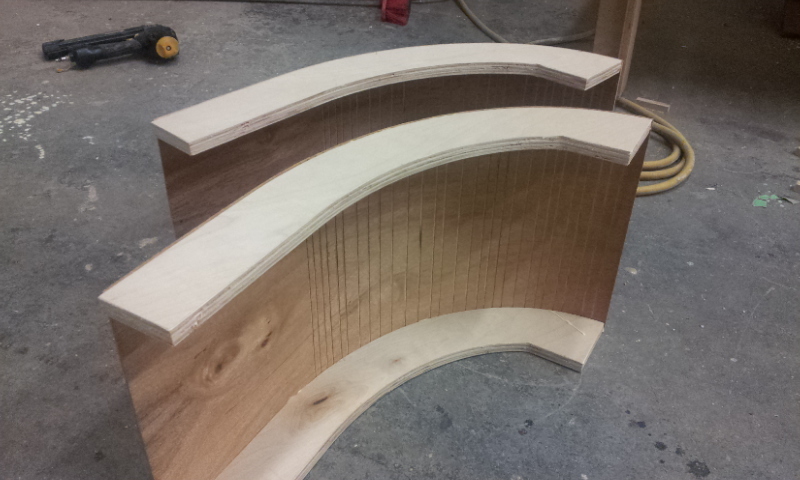 The curved trim pieces came together pretty quickly. I cut the curved ribs from 3/4" plywood. 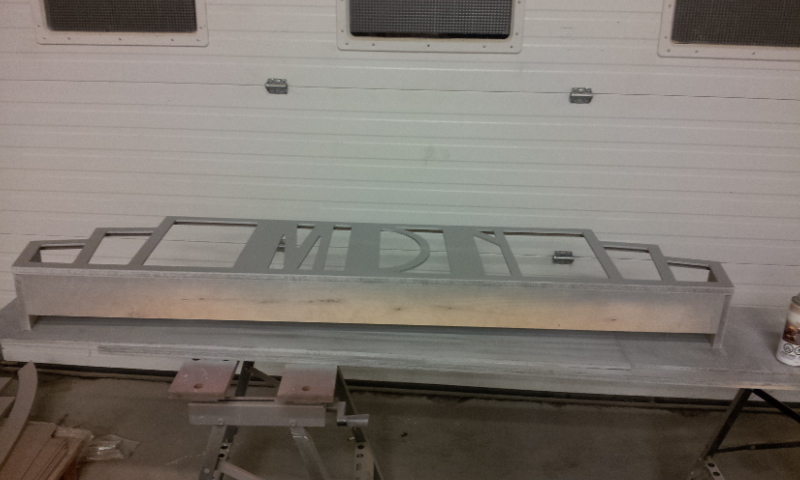 I clad the ribs with 1/8" pvc, and they got the same paint treatment. With the exception of the skinny strips top and bottom. 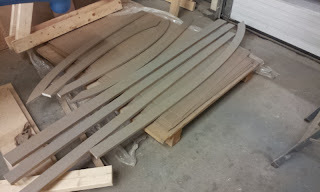 These strips were also cut from 1/8" pvc, then glued on. These strips were basically to hide the brad nails we used to hold the piece together. We didn't add the gold glaze to the smaller strips, we just left them silver. The slight contrast worked amazing! With the trim caps fastened on the stepped column tops, the look is really coming together now! 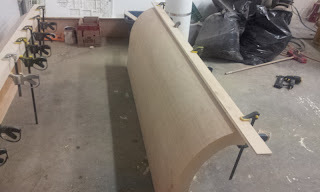 I went with 3/4" plywood for the ribs, as this would allow us to brad nail the trim on from the inside, with a great deal of holding power. 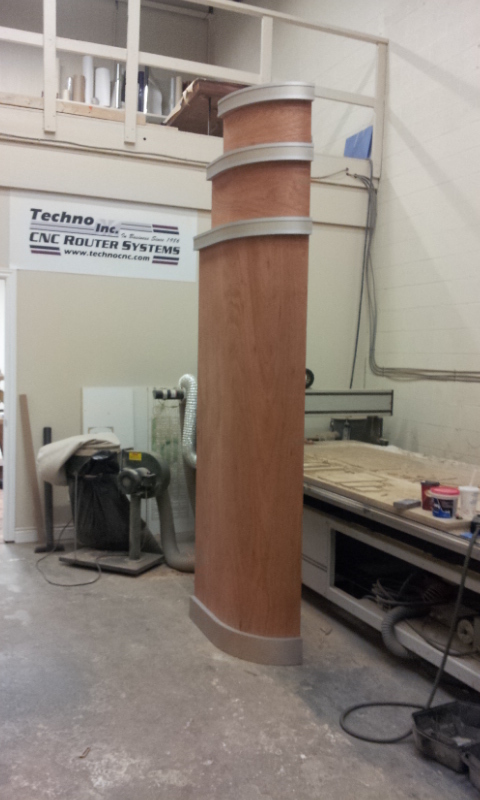 With the column assembled and done, we put it aside to get the other side started. 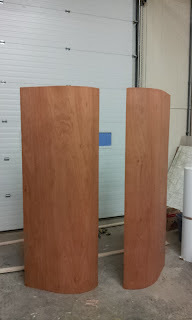 The next piece of the puzzle were the 2 front panels that will be holding up the actual tv set. This is where the long sweeping curves live. Usually at this point in the game, I can't wait to see it together, but sadly, I will have to wait until we set up on location for that. But using computers to design and machine all the parts, pretty much ensures that the whole thing works out. It took a bit of planning to get all the parts to line up at the design stage. The numbers on the display are fixed at a certain point on the screen, so with the height from the floor they requested, mixed with the clearance for the screen, it was a little concerning, but I had faith! 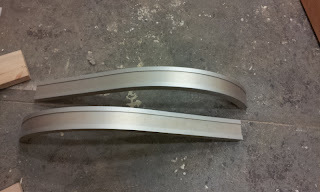 With the 2 halves clamped together, I was able to get a handle on the size. A frequent statement at Oxenham Design seems to be : "It's a lot bigger than I thought it was going to be!" The last piece to go was the header with the the shows MDN logo. 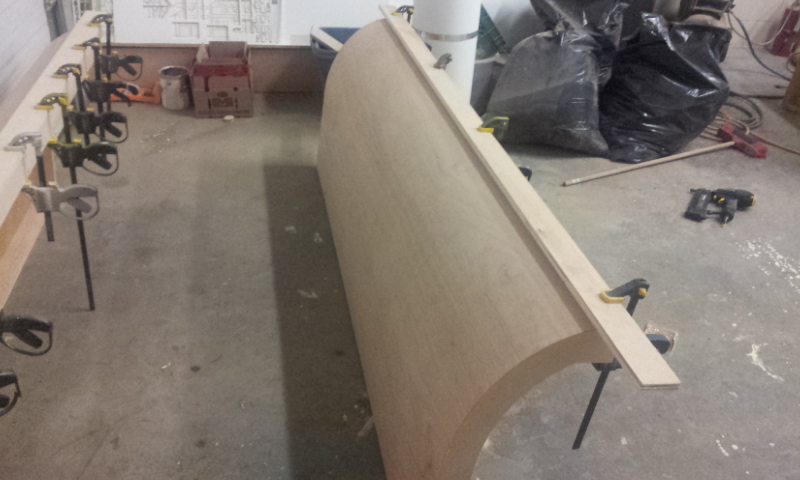 This was 5/8" mdf that we rabbeted out the back. Production wanted the logo to have inset frosted acrylic that they could backlight for a cool effect. This got the same silver treatment as the rest of the trim did. As production only had the location for the day of the shoot, we couldn't deliver the job the day before, we had to bring it on the shoot day. So we started loading up at 9 am, and arrived on set around 11:30. The install was pretty smooth. 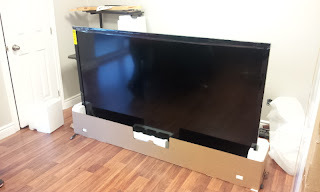 We assembled the whole structure lying face down, then carefully laid the tv into it's new home. We held the tv down with 2 padded back-braces. It took six of us to carefully hoist the whole structure up into position. 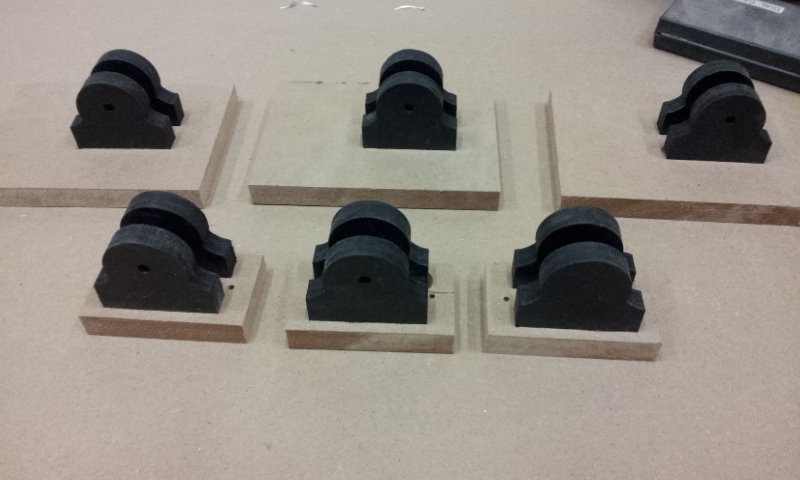 I had made 3 jack stands for the back that held 6 cinder blocks to keep it rigid. This thing wasn't going to fall over, ever. With the piece all assemble and located, the screen and header lit, it looked great! The whole location was themed in the art deco style, and looked killer. The last thing left to do was to head back at 9pm and tear it out and get it to the dumpster! A short but glorious life for those sheets of plywood! I aint got no potatoes! We finished the mountain of cardboard stencils that the township had ordered. We're still waiting on the material for the last 200 pcs. Man, I thought MDF dust got everywhere, this stuffs insane, even with our dust collector. I did get to enjoy the Thanksgiving weekend, all 3 days of it. In truth, I got a little bored, but the time off was kinda nice. I decided to finish up the remainder on the shelves, as we have a set piece that goes to camera on Sunday, for 'Million Dollar Neighborhood' that airs on OWN network. 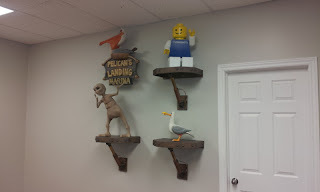 It was pretty much just small details and paint left on the 3 shelves to do, so we worked at finishing them off. We had a few rolls of rubber tubing left over from the Turbo Town build, so I thought that they would make great hydraulic lines to the cylinders that support the shelves. A few quick coats of copper spray-paint, and they were good to go. I REALLY, REALLY didn't want to spend the time fabricating little hydraulic hose-fittings, but terminating the lines right into the cylinder would look a little odd. 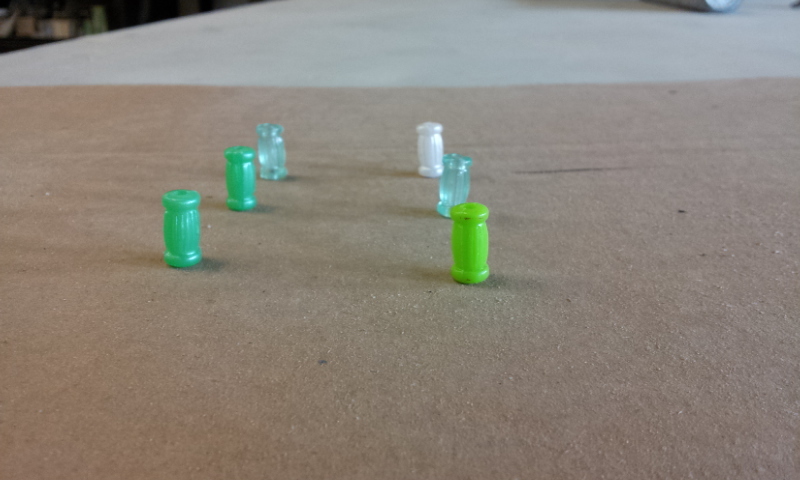 So I rooted through our numerous boxes of stuff, and came across these styrene plastic beads. PERFECT! They even had a hole in them for the mounting screw. All they needed was a quick shot of brass, and then they're done. The cylinder bottom got it's base coat of Rustoleum hammered copper paint, and we did the brass powder on the gloss black paint trick for the piston. 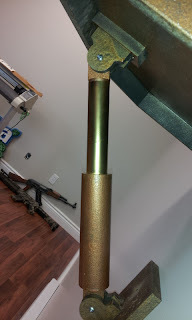 I didn't want a chrome piston as it would be to cold with the other metals we've got going on in the room. 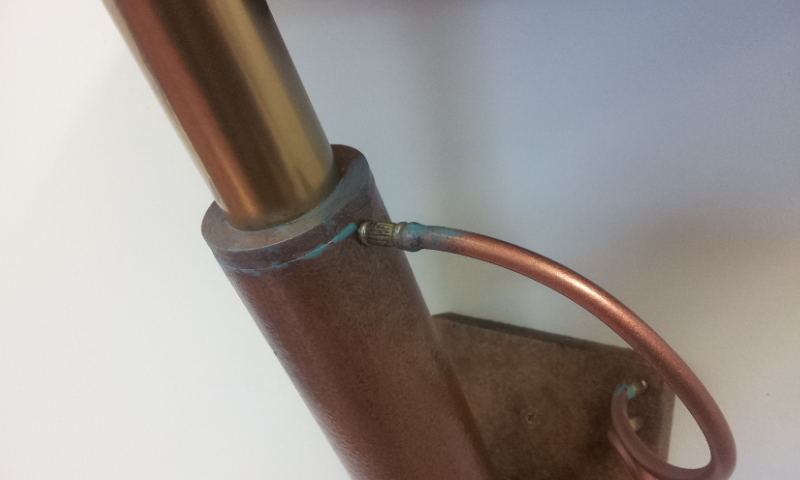 With a little patina, the tubes and fittings worked out really really well! The nice thing about the rubber hose is it's very flexible if it gets accidentally bumped by a chair or broom. 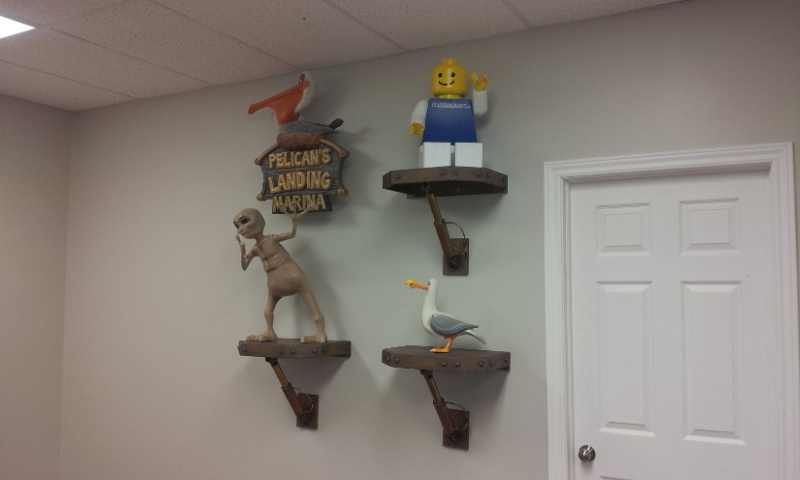 The shelves are rock solid now that they're mounted up to the wall. The underside still needs a little attention with some paint, but other than that they're good to go. These shelves can take upwards of 60 lbs, so theres no danger of them collapsing with anything I'll be putting on them to display! The space is starting to look pretty good now. It's already come a long way from the bare, cold room it was! We still have another counter to build, and a bookshelf as well, but at least most the stuff is all up and off the floor now. 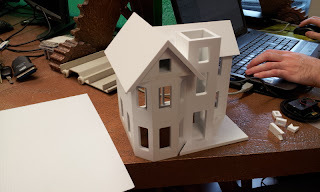 On a side note, the model-maker I had hired to work on Turbo Town, John Anderson, was in working on a project for his client. It's a trophy for a Halloween contest. Its looking pretty good so far. It's going to have a miniature haunted house sitting on a hillside, supported by some bones. Great concept. John actually drew up all the parts in Illustrator, then with some toolpathing guidelines by yours truly, he set up all the pocketing and profile cutting tool-paths in Aspire, to run on our Techno cnc. This is great for me, unpaid training that I will soon be able to take advantage of, on some future jobs!!!!!!!!! Woo Hoo! 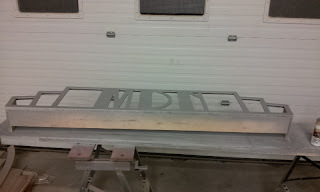 We were cutting all the doors and windows from 1/8" styrene, with a 1/16" cutter, at around 92 ipm. I guess I could've pumped up the speed,but I like my little cutter and wanted to keep it for a while! The boring-ness of cncing cardboard stencils on our Techno was broken up today when I was able to spare a bit of time to work on the shelves for the new office. They aren't overly fancy, but they'll be cool nonetheless! 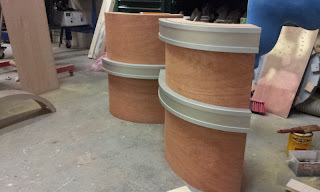 They'll match the new desk in terms of style, which will keep the theme going. The 3 shelves are basically a half octogon. 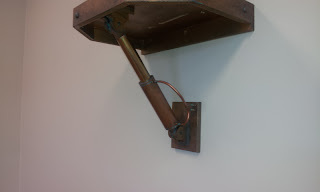 I originally wanted them to be hidden mounted, so just the shelf stood out with no supports, but as things moved forward, I decided I would need an under-support. I think this calls for some sort of hydraulic cylinder! I always have some mixed pipe kicking around the shop, so I employed it. I drew the caps and end mounts up in Aspire, and toolpathed them out to the Techno. In 3 minutes I had all the parts to start the assembly. 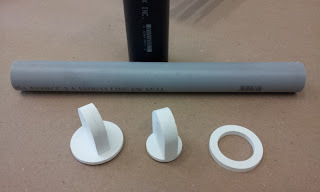 The cylinders will be made entirely from abs and pvc plastics. 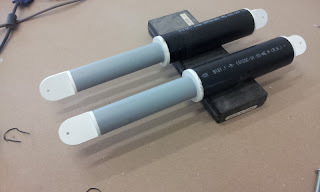 The mounts that hold the cylinders were also cut from 1/2" pvc, with the mounting plates cut from MDF. Everything was screwed and glued so there would be no "shelf malfunctions"! Because the parts were all drawn in Aspire, and precisely machined on our Techno, the whole assembly snapped together in seconds. 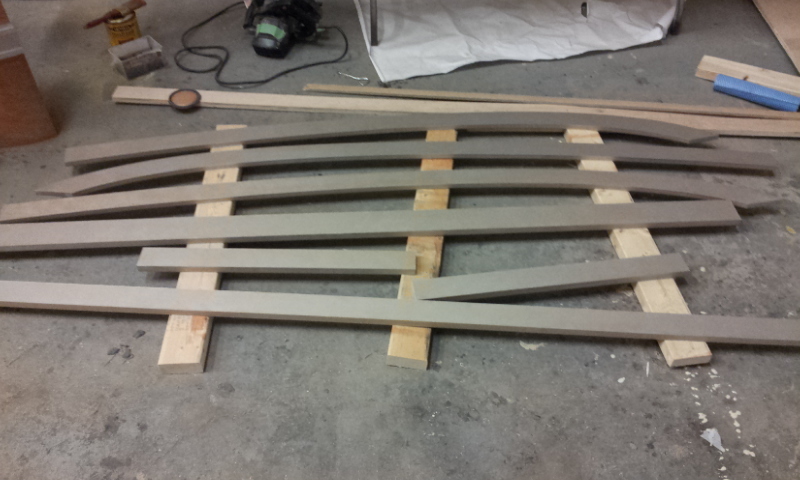 In fact, it all fit so well, there was barely any room for gluing. We got a call today for an interesting gig. They want a companies logo carved into a potatoe for a print campaign. They asked if we would make it from another material and paint it to look like a potatoe, but it's always better if you can use the real thing. So stay tuned, you may get to see first hand, Oxenham Design 3D machining a potatoe on our Techno cnc. If you can't cut it with a Techno, you can't cut it!